A majestic drummer from Manchester, James Goodwin found his way into folk and acoustic music through his playing with the band Skidoo. 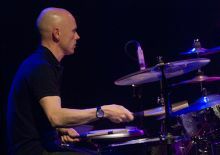 He is a regular session drummer and percussionist with the Royal Liverpool Philharmonic and BBC Philharmonic Orchestras, and has toured with Flook and The Cora Smyth Band. James also teaches drums and percussion from elementary to university level.